overlooking the beach, exclusive only to the floor this condo is on. balcony. Our kitchen is fully equipped w/granite counter tops & island. Current full time resident/homeowner of Marco Island. Elected Member of Marco Island City Council Retired US Special Agent Law Enforcement Officer. Since we live here & manage our own rentals, we take great pride in our property. That's why we have numerous returning guests year after year! We meet you at check in show you around. No "missing" rental agents to deal with. Most beautiful view of the beach on the Island. Read my Reviews!!! Apollo Condo Building is very beautiful. On the lobby floor is located a full service restaurant and outside beach bar. A fully equipped fitness center is on this floor. Large Tennis Courts are on the second floor, just above your covered parking area. Our spacious pool includes an outdoor Spa with a view of and direct access to the Gulf Beach. Complete pool furniture is available and beach chairs are provided in the Condo unit for guest use. Two large screen TV sets are provided with hi speed internet service. Ceiling fans in the Kitchen and bedroom are provided for your comfort. Laundry rooms with hot water washers and dryers are located on every floor of the building. Condo owner resides 2 miles away should you have aditional requests. Also included is dishwasher, Microwave, Blender, coffee maker, toaster and other amenities.Entire building is fully air conditioned. Perfect Ocean view from the balcony! We definitely enjoyed our time at the Apollo condo's and had a fantastic time at the beach. Marco Island is very classy and a wonderful place to visit. Our only complaint was the key system in the condo. You have to use a metal key to unlock the elevators, to get into the building, to get to the pool are, to the gym, etc. It is very cumbersome and annoying when you're carrying all your beach stuff. If the condo could switch over to key fobs it would be immensely better than the old-fashioned keys. Also, there's a restaurant under the condo so a lot of people going in and out from the public, but it didn't bother us at all. Overall, it was a great vacation and we will definitely come back again. Unit is as pictured, with a nice view of the beach. Somewhat dated, could use a fresh coat of paint, but economical. Condo is right on the beach and affords outstanding sunset views over the Gulf. We were concerned that there might be noise from the restaurant below the unit, but it wasn't an issue at all. Lots of beach activity right in front of the unit. Complex is older but well maintained. Could not have been happier. Joe lives nearby and makes sure that everything is in order. Great communications. We hope to be back. Thank you so much for your kind words regarding our beautiful property! You make our day when you enjoy our "Paradise". Apollo condominiums is a great location to stay on Marco Island. The lobby is very welcoming and management staff friendly and very helpful. It’s very close to the beach and only a 15 minute walk to a local square with a variety of restaurants. The apartment has a beautiful view of the beach and sea, often seeing dolphins swimming by at various points of the day. The apartment is in need of some redecoration and seemed as though it hadn’t been used for a while but it served our needs. We made use of local attractions and enjoyed the convenience of Sunset Grille, the bar/restaurant at the base of Apollo condos. They have friendly staff and a varied menu whilst enjoying the amazing sunset views. Although the building is older, it has everything you need for a great vacation. Close to the south end of Marco Island makes this a beautiful and quiet beach location. The condo unit offers beach chairs and plenty of towels. The owner of the condo was great to work with. Due to the red tide in the Ft Myers area (where we were originally planning to stay) we had to make last minute lodging changes. Joe worked with us in our time of distress and we will forever be grateful for his willingness to accommodate us. Thank you so much for the nice words regarding our property. We take great pride in keeping it perfectly clean & updated & we enjoy having very fine Guests such as you! The building is actually one of the newest on the beach, having opened in 1991. Great location, wonderful view of beach, ocean and sunsets! Our condo was clean and affordable. 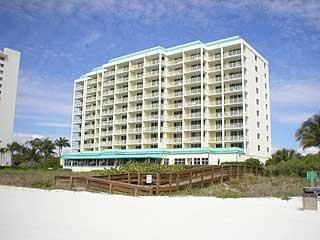 We would stay there again and would recommend to parties of 2 staying at Marco Island. there be a need and a health care center is located on Marco Island. the perfect cleanliness and up to date furnishings! Tourist tax & cleaning charges are included in rental rates quoted. While you may be quoted a rate based upon a percentage of the standard weekly rate, please note that the weekly rate applies to all rentals whether 1 night or 7 nights! A $25. 1 time tearly parking fee needs to be paid to condo Association Manager at check in.